Belize, formerly known as British Honduras, is a small nation on the eastern coast of Central America, on the Caribbean Sea, bordered by Mexico to the northwest and Guatemala to the west and south. The country is a parliamentary democracy and constitutional monarchy which recognizes Queen Elizabeth II as sovereign. The nation of Honduras is a near neighbor, 47 miles (75 km) away across the Gulf of Honduras to the east. The name is derived from the Belize River which Belize City, the former capital and largest city, is also named after. In Spanish it is usually called Belice. Belize was a British colony for more than a century, known as British Honduras, until 1973. It became an independent nation in 1981. Belize is a member of Caribbean Community (CARICOM) and the Sistema de Integracion Centro Americana (SICA) and considers itself to be both Caribbean and Central American. With 8,867 square miles (22,960 sq. km) of territory and only 291,800 people (Belize CSO, 2005 mid year est. ), the population density is the lowest in the Central American region and one of the lowest in the world. Most Belizeans are of multiracial and multiethnic descent. Though part of the Central American isthmus, Belize has more in common with its Caribbean island neighbors than its Central American neighbors in that it has somehow escaped the volatile history common to the isthmus. The country's growth rate, 2.207 percent (2008 est. ), is the highest in the region and one of the highest in the Western Hemisphere. Belize is located between the Hondo and Sarstoon rivers, with the Belize River flowing down the center of the country. The north of Belize consists mostly of flat, swampy coastal plains, in places heavily forested. The south contains the low mountain range of the Maya Mountains, whose Victoria Peak is the highest point in Belize at 1,160 m. The Cockscomb Basin Wildlife Sanctuary is a unique sanctuary in southern Belize that covers about 150 square miles of tropical forest and is the world's only jaguar preserve. 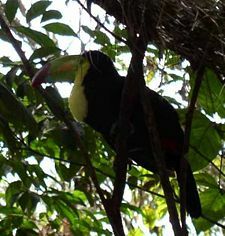 Cockscomb is also renowned for its bird populations and boasts up to 300 recorded species including the national bird of Belize, the keel billed toucan. All along the Caribbean coast are found coral reefs or cays and the coastline is lined with mangroves. Belize is home to the Belize Barrier Reef, the longest barrier reef in the Western Hemisphere and the second-longest in the world after the Great Barrier Reef. Here, numerous fish, turtles, tortoises, and manatees thrive and for this reason it is a popular ecotourism, scuba diving, and snorkeling destination for tourists. Belize's national animal is the tapir, which has protected status and can attain a weight of as much as 600 pounds. Other wildlife in Belize include deer, jaguar, puma, and many other species of reptiles, insects, and birds. Belize has a tropical climate with pronounced wet and dry seasons, although there are significant variations in weather patterns by region. Temperatures vary according to elevation, proximity to the coast, and the moderating effects of the northeast trade winds off the Caribbean. Average temperatures in the coastal regions range from 24°C in January to 27°C in July. Temperatures are slightly higher inland, except for the southern highland plateaus, such as the Mountain Pine Ridge, where it is noticeably cooler year round. Overall, the seasons are marked more by differences in humidity and rainfall than in temperature. Average rainfall varies considerably, ranging from 1,350 millimeters in the north and west to over 4,500 millimeters in the extreme south. Seasonal differences in rainfall are greatest in the northern and central regions of the country where, between January and April or May, fewer than 100 millimeters of rain fall per month. The dry season is shorter in the south, normally only lasting from February to April. A shorter, less rainy period, known locally as the "little dry," usually occurs in late July or August, after the initial onset of the rainy season. Hurricanes have played key—and devastating—roles in Belizean history. In 1931, an unnamed hurricane destroyed over two-thirds of the buildings in Belize City and killed more than 1,000 people. In 1955 Hurricane Janet leveled the northern town of Corozal. Only six years later, Hurricane Hattie struck the central coastal area of the country, with winds in excess of 300 kilometers per hour and 4-meter storm tides. The devastation of Belize City for the second time in thirty years prompted the relocation of the capital some eighty kilometers inland to the planned city of Belmopan. The most recent hurricane to devastate Belize was Hurricane Greta, which caused more than US$25 million in damages along the southern coast in 1978. 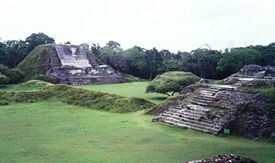 Altun Ha archaeological site, Belize. The Mayan civilization spread over Belize between 1500 B.C.E. and 300 C.E. and flourished until about 900 C.E. The first Europeans arrived in the area in the early sixteenth century and settlement began with British privateers and shipwrecked English seamen as early as 1638. The origin of the name Belize is unclear but one explanation is that it derives from the Spanish pronunciation of "Wallace," the name of the pirate who created the first settlement in Belize in 1638. Another possibility is that the name is from the Maya word belix, meaning "muddy water," applied to the Belize River. Taking advantage of Spain’s inability to establish—and apparent lack of interest in establishing—control over present-day Belize, Englishmen began to cut logwood (Haematoxylon campechianum), a dyewood greatly valued in Europe as the principal dyestuff for the expanding woolen industry. By the 1770s, a second tropical exotic timber, mahogany (Swietenia macrophylla), replaced logwood as the main export from Belize. The economy of Belize remained based on the extraction of mahogany until the early 1900s when the cultivation of export crops such as citrus, sugar cane, and bananas came to dominate the economy. The Spanish Empire granted the United Kingdom rights to establish logging camps in the area, but not to set up a colony on the land, which the Spanish Crown wished to maintain theoretical sovereignty over. While not an official British colony, British use and occupation of the area increased. In 1798, the United Kingdom and Spain went to war, and the Spanish governor-general of Yucatán sent a fleet of 32 ships to seize the British settlements. From September 3 through September 10 a series of battles was fought around the islands and reefs off the Belizean coast, after which the Spanish forces withdrew. This is known as the Battle of St. George's Caye, and is celebrated as a national holiday each September 10. The early settlement of Belize in the Bay of Honduras grew from a few habitations located at Belize Town and St. George's Caye, into a de facto colony of the United Kingdom during the late eighteenth century. In the early nineteenth century, the settlement was called the British Honduras, but Belize was not formally termed the Colony of British Honduras until mid-century, eventually becoming a crown colony. Hurricane Hattie inflicted significant damage upon Belize in 1961. After this event, the government decided that having a coastal capital city that was below sea level was too risky. 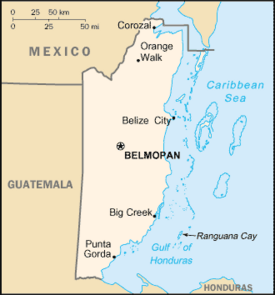 Over several years, the British colonial government designed a new capital Belmopan at the exact geographic center of the country, and in 1970 began slowly moving the governing offices there. British Honduras became a self-governing colony in January 1964 and was renamed Belize in June 1973; it was Britain's last colony on the American mainland. Throughout Belize's history, Guatemala has claimed ownership of all or part of the territory. This claim is occasionally reflected in maps showing Belize as Guatemala's most eastern province. 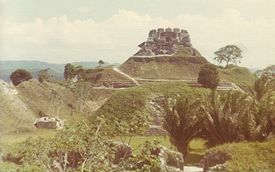 The government of Guatemala long claimed that Belize was rightfully Guatemalan territory, supposedly inheriting rights to the land from the Spanish Crown. Fear of invasion by Guatemala long delayed the independence of Belize. Finally the United Kingdom agreed to defend Belize from invasion if necessary after independence; this agreement led to full official independence granted on September 21, 1981, under the leadership of long time prime minister and independence advocate George Price. Guatemala refused to recognize the new nation until 1991. As of 2005, the border dispute with Guatemala remained unresolved and quite contentious.At various times the issue has involved mediation assistance from the United Kingdom and the CARICOM heads of government. 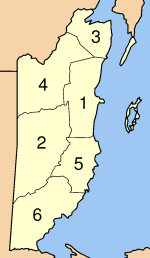 The six districts of Belize: (1) Belize, (2) Cayo, (3) Corozal, (4) Orange Walk, (5) Stann Creek, (6) Toledo. Politics in Belize take place in a framework of a parliamentary representative democratic monarchy, whereby the prime minister is the head of government, and of a pluriform multi-party system. Executive power is exercised by the government. Legislative power is vested in both the government and the Parliament of Belize. The party system is dominated by the People's United Party and the United Democratic Party. Constitutional safeguards include freedom of speech, press, worship, movement, and association. The Judiciary is independent of the executive and the legislature. Jurisprudence is based on English common law. Cabinet ministers are members of the majority political party in parliament and usually hold elected seats within it concurrently with their cabinet positions. The bicameral Belizean parliament is the National Assembly, which consists of a house of representatives and a senate. The 29 members of the House are popularly elected to a maximum 5-year term. The Senate consists of 12 senators plus the president of the Senate. The senators are appointed by the governor-general as follows: six (6) on the advice of the prime minister, three (3) on the advice of the leader of the opposition, one (1) member on the advice of the Belize Council of Churches and the Evangelical Association of Churches, one (1) on the advice of the Belize Chamber of Commerce and Industry and the Belize Business Bureau and one (1) on the advice of the National Trade Union Congress of Belize and the Civil Society Steering Committee. The president of the Senate is then selected by the 12 senators, either from amongst themselves or from the general populace. The president presides over the sessions of the Senate but ordinarily has no voice or vote in the proceedings (as would an appointed senator), except in the cases of the passing of bills where he or she has a casting vote. Belizean protests, January 21, 2005. Where the president is selected from amongst the 12 senators, the powers of senator and president of the Senate are vested in this one person. Otherwise, the president has no powers as would ordinarily be vested in a senator. Over the past few years, there has been much debate over whether the members of the Senate should be appointed or elected. On February 8, 2008, Dean Barrow was sworn in as Belize's first black prime minister. Belize is a full participating member of the Caribbean Community (CARICOM). The majority of the Belizean economy is comprised of the tourism industry. Agriculture is also a key part of the economy. The small, essentially private enterprise economy of Belize is based primarily on agriculture with tourism (especially scuba diving) and construction assuming greater importance. Agro-based industry and merchandising are contributors to the economy. 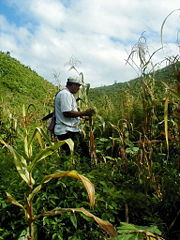 Sugar, the chief crop, accounts for nearly half of the exports of Belize. The banana industry is the country's largest employer. Citrus production has become a major industry along the Hummingbird Highway. The government's expansionary monetary and fiscal policies, initiated in September 1998, led to GDP growth of 6.4 percent in 1999 and 10.5 percent in 2000. Growth decelerated in 2001 to 3 percent due to the global slowdown and severe hurricane damage to agriculture, fishing, and tourism. Major concerns continue to be the rapidly expanding trade deficit and foreign debt. A key short-term objective remains the reduction of poverty with the help of international donors. Belize's population is 294,385 (July 2007 est.). Emigration is relatively high—approximately 105,000 Belizeans currently live abroad (mostly in the United States). Most Belizeans are of multiracial and multiethnic descent. However, for census purposes as well as Belizean custom, people are usually recognized by their father's ethnicity. About 49 percent are of mixed Mayan and European descent (mestizo). The first mestizos to settle in Belize were Mexicans fleeing from the Caste War of the Yucatan Peninsula in 1847–1848. They founded the town of Corozal (1849), where their descendants can be found living today. A second and larger mestizo migration took place during the 1980s with the arrival of thousands of refugees from Guatemala and El Salvador. Until the early 1980s, Belizean Creole constituted 70 percent of the population, but today they are only about 25 percent of the population. This was due to the influx of refugees from neighboring countries as well as the emigration of thousands of Creoles. Creoles are descendants of African slaves brought primarily from Jamaica and Nicaragua’s Miskito Coast to cut down mahogany trees. The Swing Bridge, on Haulover Creek. Belize City. Though no longer the majority, Creole culture is still dominant in Belize (especially Belize City). The indigenous Mayas make up about 10 percent of the population. The Garifuna (Garinagu) are descendants of Africans as well as Carib and Arawakan Amerindians and make up 6 percent of the population. In the early 1600s at least two thousand Amerindians escaped their Spanish captives on the Island of San Vicente, what is now Saint Vincent. They are said to have never been slaves and they have retained many of their cultures and customs that would support this. When the English took control of the island, the “Red” Caribs were mostly exterminated, and the “Black” Caribs were deported to Roatan Bay in Honduras. Many would settle in Guatemala, Nicaragua, and Belize. The rest of the population of Belize is Chinese, East Indian, and North American. The official language of Belize is English. It is the sole language of instruction in the school systems. Around 80 percent of the population is literate in English and as much as 90 percent of the population is able to speak at least some of the language. The most common language however is Belizean Creole or Kriol. Kriol is the lingua franca in much of the country and is spoken by nearly everyone in Belize as either a first or second language (95 percent of people in Belize City speak Belizean Creole). To speak it is to be Belizean. Overall, Kriol is spoken by 70 percent of the entire population as a first language (with around 20 percent speaking Creole solely). The next most widely spoken language is Spanish, which is spoken by approximately 30 percent of the population. In Orange Walk and Corozal Districts, Spanish is the majority language (60 percent). Some communities in southern Belize speak Garifuna and the Kekchi, Mopan, and Yucatan Maya languages. Despite the many languages (around 8 different languages in all) the 2000 census also estimated that around 70 percent of all Belizeans were bilingual or even trilingual. 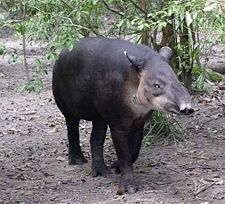 The tapir, the national animal of Belize. The keel billed toucan, the national bird of Belize. Belize boasts a rich mix of ethnicities including Creole, Maya, Mestizo, East Indian, Chinese, and Garifuna. Among its cultural attractions are the thousands of Mayan archaeological temples. In 2001, UNESCO declared the Garifuna language, dance, and music a "Masterpiece of the Oral and Intangible Heritage of Humanity" in Belize, Honduras, and Nicaragua. Belize is the only country in Central America without a Pacific coastline and also the only one with English as its official language. Ninety-three percent of its land mass is under forest and it also possesses the largest cave system in Central America. As a result, Belize's biodiversity, both marine and terrestrial, is rich, with a host of flora and fauna. Forty-two percent of its territory falls under some form of official protected status. As such, conservation activities remain an important priority in government policy with the notable example of having the only jaguar reserve in the world among its protected areas. However, Belize is best known for its marine environment, in particular, for having the longest-living barrier reef in the Western Hemisphere and the second-longest contiguous reef in the world after Australia’s Great Barrier Reef. Consequently, divers flock to Belize to enjoy its underwater attractions. Belize, because of its medley of cultural attractions, unique marine and terrestrial biodiversity, and conservation efforts, is fast becoming a hotspot for travelers seeking ecotourism and adventure vacation experiences. Colonization, slavery, and immigration have played major roles in affecting the ethnic composition of the population and as a result, Belize is a country of various cultures, languages, and ethnic groups. Belize consists of Creole, Garifuna, Mestizo, Spanish, Maya, British, Lebanese, Chinese, and East Indian peoples. Due to racial harmony and the religious tolerance of its various Christian peoples, all of these different elements have mixed and blended successfully, and Belize has gained a widespread reputation for its friendliness. Food, music, and socialization in Belize are as diverse as the people with whom they are associated. Belize is a predominantly Christian society. Roman Catholicism is accepted by about half of the population, and Protestantism by about a quarter, many of which are Mennonite. Much of the remaining population is comprised of Daoists, Buddhists, and more recently introduced religions like Jainists, Islam, and Bahá'í. Hinduism is followed by most Asian immigrants; Islam is common among the Middle-Eastern immigrants and has also gained a following among Creoles and Garifuna. Religious freedom is guaranteed and churches dot the streets of Belize almost as much as places of business; Catholics frequently visit the country for special gospel revivals. Jehovah's Witnesses have also enjoyed significant increases in recent years and now make up around 2 percent of the population. ↑ 1.0 1.1 1.2 1.3 Belize. International Monetary Fund. Retrieved 20 April 2011. ↑ Human Development Report 2010. United Nations (2010). Retrieved 5 November 2010. ↑ Belize National Parks, Natural Reserves, and Wildlife Sanctuaries, Cockscomb Basin Wildlife Sanctuary. Retrieved June 30, 2007. 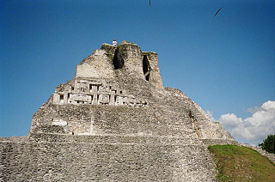 ↑ Association for Belizean Archaeology, Maya Archaeological Sites in Belize, Cubola Productions, Belize. Retrieved June 29, 2007. ↑ Frances Robles, Guatemala-Belize fight on border turns deadly, The Miami Herald, December 20, 2001. Retrieved June 29, 2007. ↑ ACP-EU supports Belize’s sovereignty, Amandala Online, March 26, 2000. Retrieved June 29, 2007. ↑ National Kriol Council of Belize, Belize Kriol. Retrieved June 29, 2007. All links retrieved June 1, 2016. Background Note: Belize. U.S. Department of State. This page was last modified on 1 June 2016, at 20:16.